In 2016, a friend messaged me on Facebook asking if I knew any college juniors or seniors that would like to apply for internships at the Virginia Arts Festival, one of Virginia’s leading performing arts presenters. I, an overly eager college sophomore, jumped at the opportunity. After gaining further information and awkwardly trying to backpedal, I realized there was no harm in applying. I was blessed to acquire the position, and as a result became fascinated with marketing and communications. 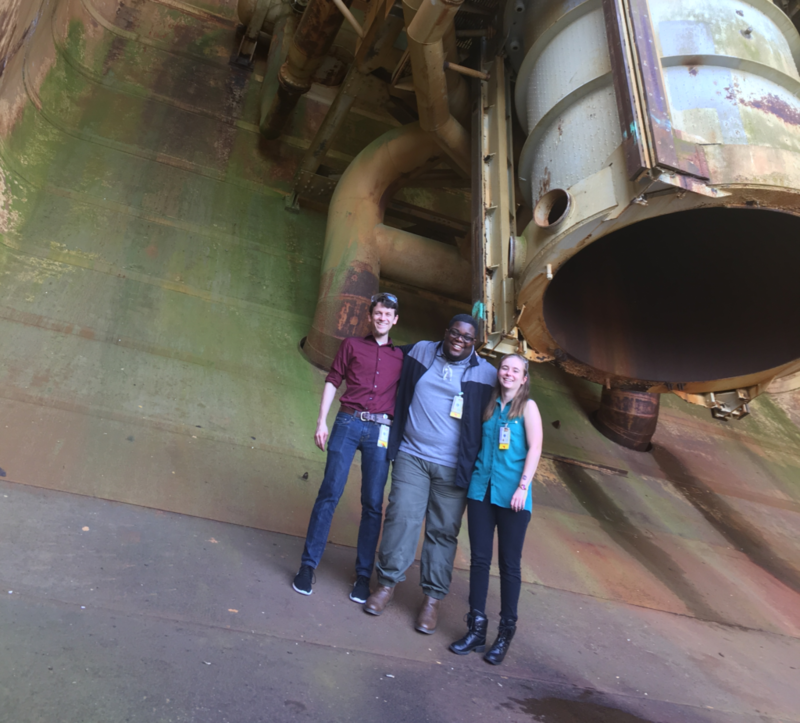 Fast forward about two years, after two internships in the entertainment industry, I am currently a communications intern at NASA Langley Research Center. Having transitioned from the entertainment industry into the STEM field, I’ve learned that these very different environments share a range of similarities. From working with artists to working with engineers I have found that in every workplace, communication is the foundation of clarity, understanding and collaboration. 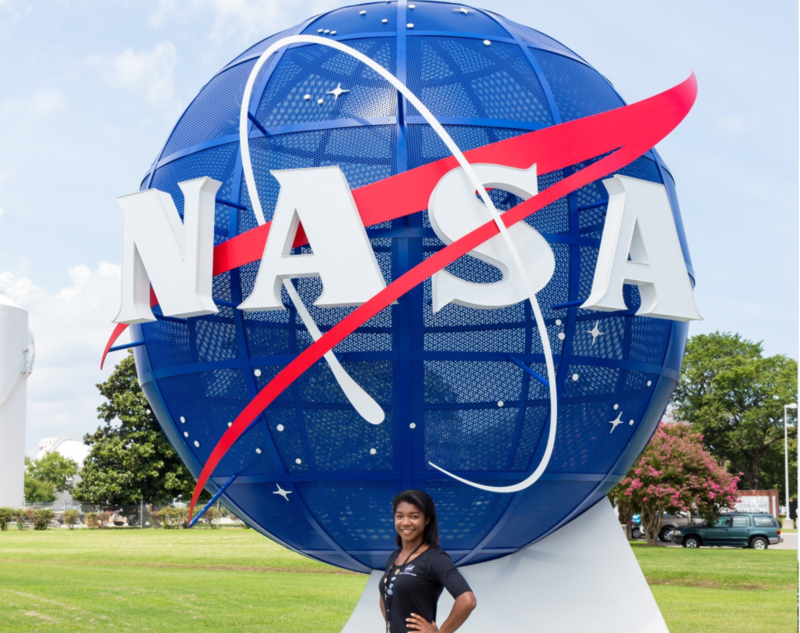 Jasmine Hopkins in front of Langley Research Center’s NASA Meatball. In my current role I support outreach and interdepartmental communication for the Fabrication Technology Development Branch (FTDB). This takes many forms which are determined by the audience and content. For outreach, organizational tours are the primary form of communication. Tours, which vary by age and number of attendees, act as educational events that cover the capabilities and projects in FTDB. For internal communication, I create Snapshots for the Engineering Directorate on behalf of FTDB. Snapshots are weekly updates that allow employees to follow the progress of major projects and feature their work or contributions. 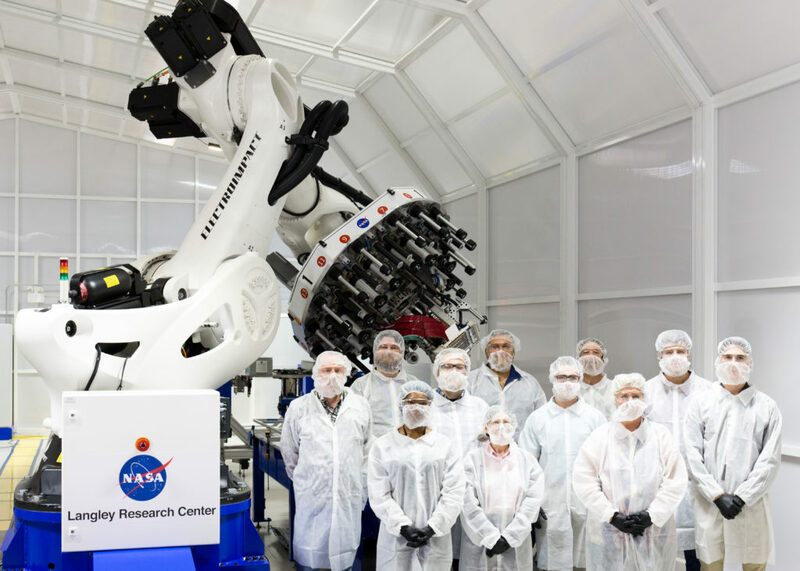 Jasmine Hopkins and other team members in front of ISAAC, a robot at NASA’s Langley Research Center. To improve the accuracy and clarity of communication, I study the equipment in FTDB, manage the employee Snapshot database, and regularly speak with researchers to fact-check information concerning their projects. However, I’ve found that accurate, clear communication isn’t enough. Well-rounded communication should also be personable because people are interested in the employees behind the work. I’ve had the opportunity to orchestrate tours for employees, students and fellow interns. During the summer, I gave a tour to a group of NASA Community College Aerospace Scholars that taught me the value of well-rounded communication. I gave my rehearsed speech and included a little information about myself, a community college graduate. Later, one of their supervisors thanked me saying, “You helped them see themselves here.” The tour was well received, but not because it contained a lot of technical information. It was well received because of our commonality. 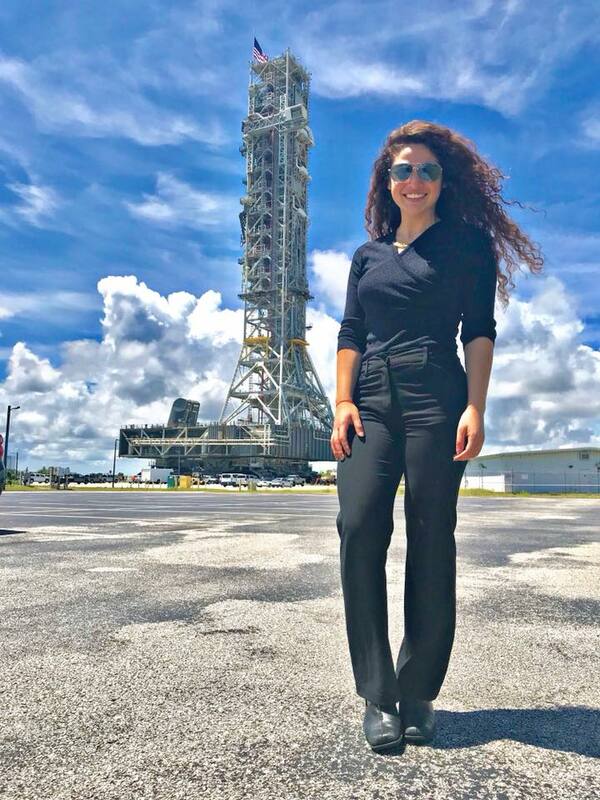 That experience taught me that communication is the essence of human connection, and I am thankful every day that I have the opportunity to support communication here at NASA. Jasmine Hopkins is a current student at Christopher Newport University, earning a Bachelor of Science in Business Administration with a concentration in Marketing. She previously earned her Associate of Science in Business Administration from Tidewater Community College. 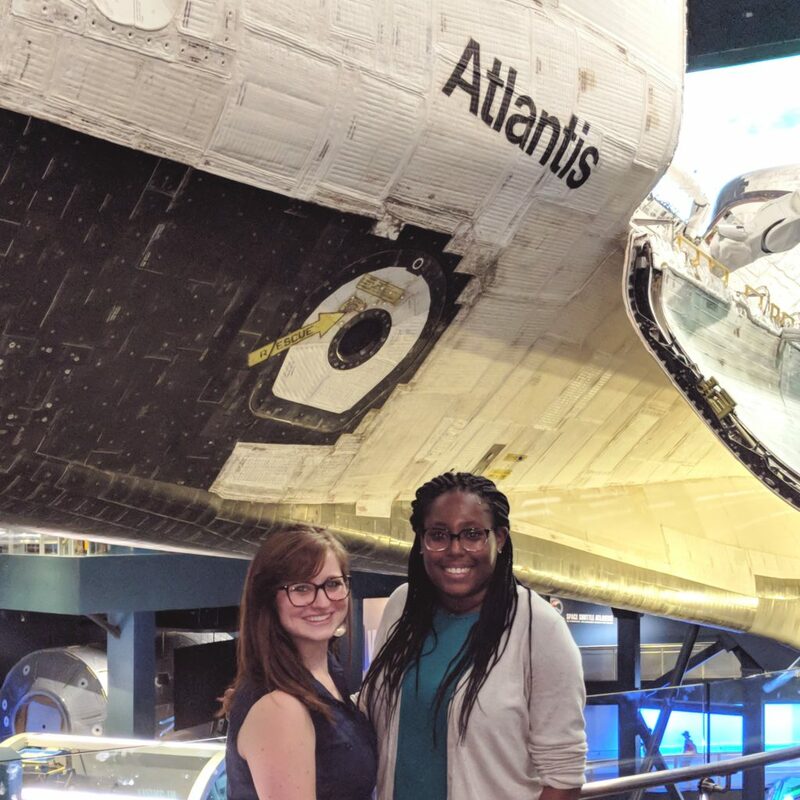 What does it mean to be a space law intern? What does space law even mean? Before beginning our summer internship, we had very little exposure to this exciting world. Now that we’ve gained a bit of experience, we’d like to share what a typical week looks like. 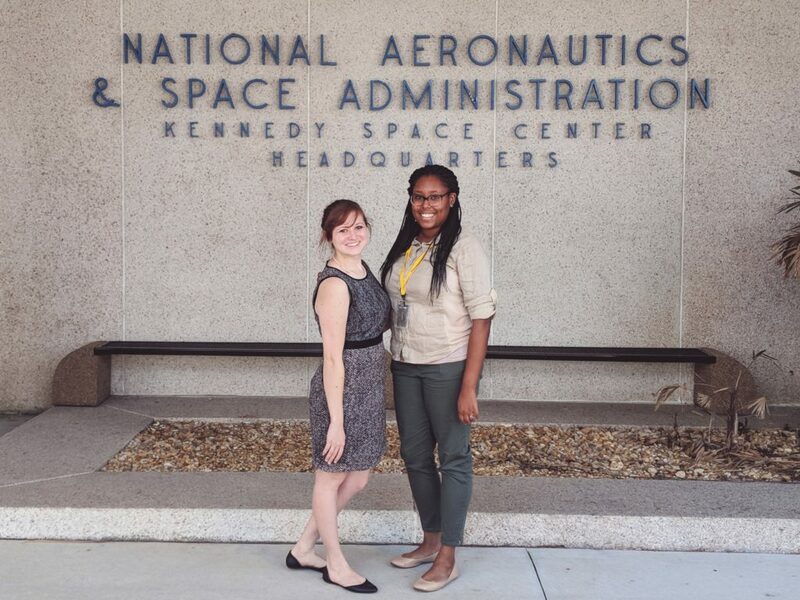 Sarah Iacomini (left) and Nicole Williamson (right) interned at NASA’s Kennedy Space Center during the summer of 2018. When I was little, I watched the Apollo 13 movie over and over again ꟷ surprised each time that duct tape saved the astronauts. Since then, I admittedly have not had much interaction with space… but when I was given the chance to tackle space law, I accepted because, really, who wouldn’t want to work for NASA? These past few weeks have been a major learning curve in space technology and NASA acronyms. Here, the day-to-day attorney work mostly revolves around what happens on Earth: administrative, procurement, and intellectual property law, among many other practice areas. Each day has been new adventure, and I’m excited to learn more about the federal government throughout the summer. On the very first day of law school, we were asked to envision our future. What was the coolest thing we could possibly imagine doing in our careers? My answer: to be the first lawyer in space. To me, space is the future, and I want to be at the forefront of helping shape and enforce the laws that make space exploration possible. This summer, I’ve gotten the chance to advance one step closer; by enhancing my knowledge of the law through fascinating administrative law projects, and by learning what it takes to actually go into space. What does our week look like? 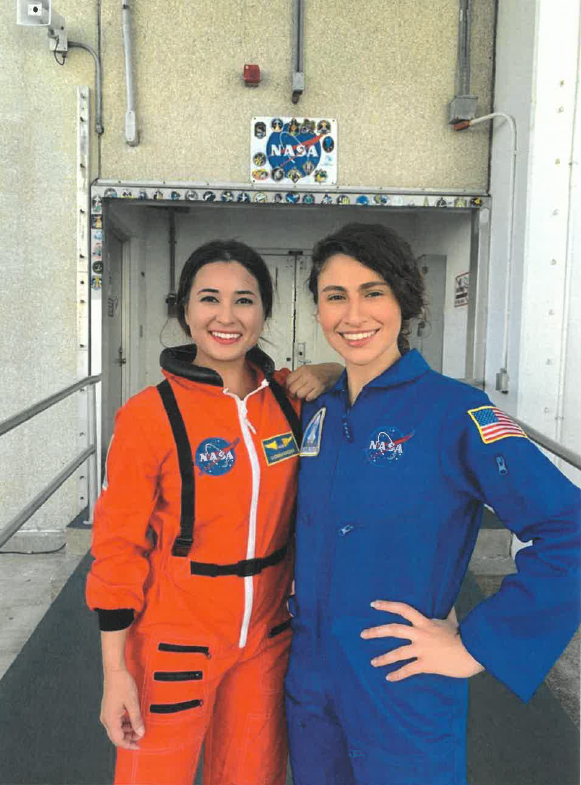 Sarah Iacomini (left) and Nicole Williamson (right) in front of the Space Shuttle Atlantis at NASA’s Kennedy Space Center Visitor Complex. Our drive into Kennedy Space Center each morning takes us down the causeway, a thin grass strip cutting across the heart of the shimmering Indian River. Approaching KSC, the mockup of a red external fuel tank that looms above the Visitor Center’s Atlantis exhibit serves as a landmark, an immediate reminder to all who enter: we’re in space territory now. While at KSC, we’ve had the unbelievable opportunity to visit the Vehicle Assembly Building (VAB), the tallest single-story building in the world; see the launch pads, crawler-transporter, and mobile launcher; and many of the center’s non-space wonders, such as the alligators, wild pigs, and native birds that call this nature preserve home. Amid this incredible world of space vehicles and the people who bring inventions to life, we study the law. It may seem less glamorous, but it’s no less important. In the Chief Counsel’s office, we help research the laws that determine who works on these projects and how people interact; how we get all the supplies needed; who has “rights” to these newly developed inventions; and most importantly, how it’s all paid for. In other words, we look at laws in the realm of employment, ethics, intellectual property, procurement, and appropriations. On any given Monday, you may find us researching an issue in the Federal Acquisition Regulations (FAR), trying to find the relevant clause. Or you may find us looking up cases – hours of modifying search terms and reading through opinions waiting for that exciting flash of recognition… a case that directly addresses our research question! Tuesdays are for staff meetings! The entire Chief Counsel’s office gathers to discuss the week’s most important legal issues, both the big, ongoing concerns and the “small fires” – pressing issues the attorneys need to untangle to ensure everything runs smoothly. On Wednesday mornings, we attend meetings with the Technology Transfer Office. The 1958 Space Act directs NASA to “provide for the widest practicable and appropriate dissemination of information concerning its activities and the results thereof.” In keeping with this directive to disseminate NASA inventions, Tech Transfer facilitates commercialization efforts for NASA Kennedy Space Center-developed technologies. The work often involves consultation with the intellectual property law team to review patentable technologies, licensure capabilities, and any concerns related to proprietary information. 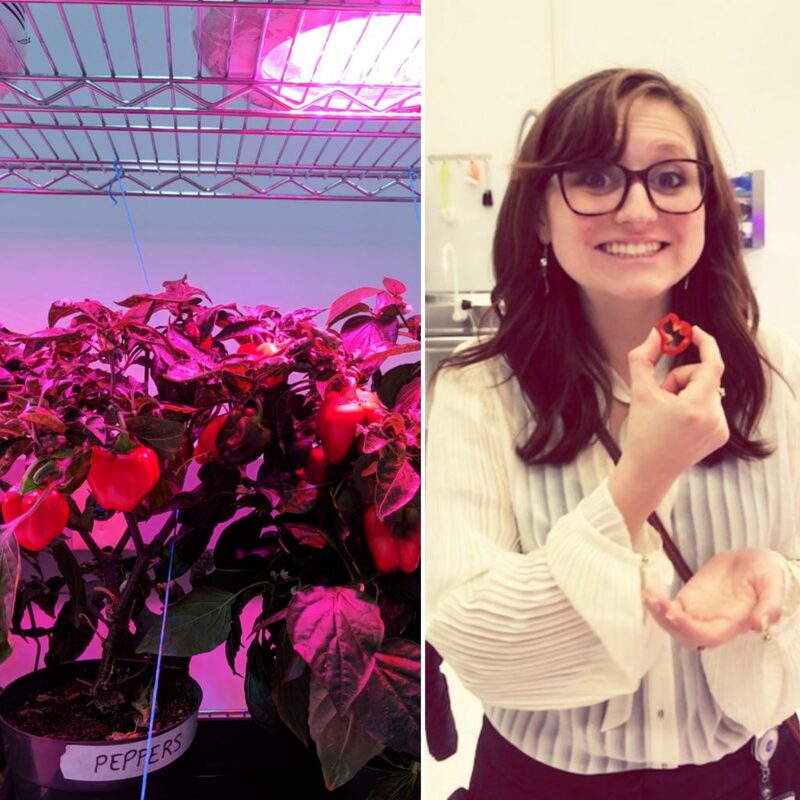 Sarah Iacomini samples peppers grown in the “Veggie” Lab at NASA’s Kennedy Space Center. 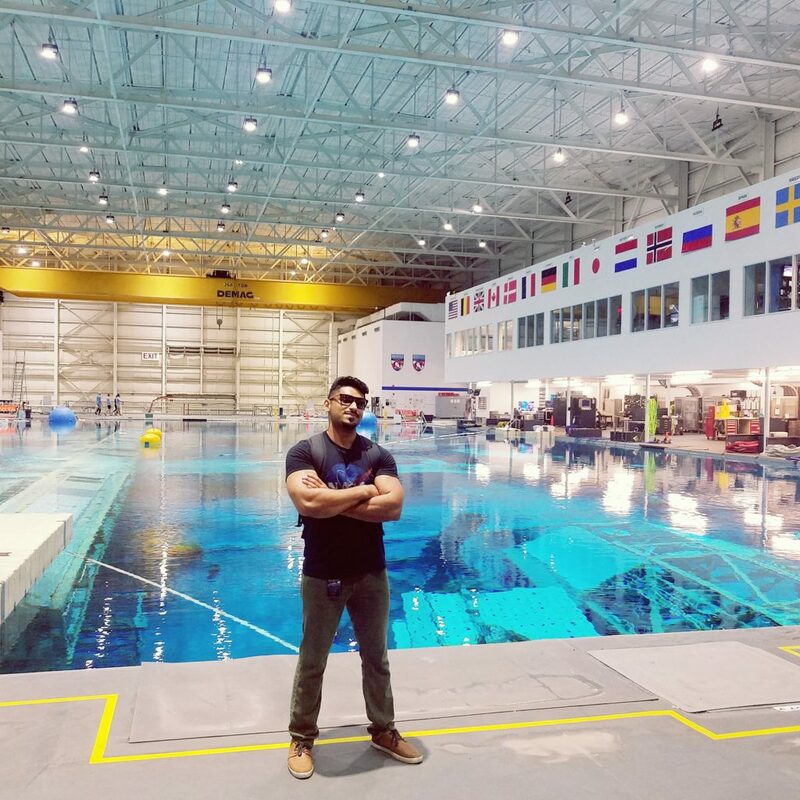 One incredible opportunity we’ve had is to take tours of NASA facilities and labs. For instance, last Thursday we visited the Vegetable Production System lab, or “Veggie,” which allows for plant growth in space. NASA has been involved in the development of several crops – for example, lettuce was recently grown on the International Space Station (check this out to see the astronauts eat it!). As NASA plans for longer voyages, growing plants that can provide replenishment of nutrients vital to human health are high in demand. Peppers are a great space-crop candidate – they have nearly quadruple the amount of Vitamin-C as a glass of orange juice. We even got to try some! Additionally, growing plants in space also benefit the psychological health of astronauts far from home. Okay, so *maybe* this doesn’t happen every week, but last Friday we watched a commercial resupply mission head to the International Space Station. Around 4:45 A.M., we unfolded our lawn chairs on the causeway, directly facing Space Launch Complex 40. At 5:42 A.M., the first glimmer of yellow light flashed on the horizon, and within minutes the only trace of the SpaceX Falcon 9 rocket was a spectacular multi-colored vapor trail hovering above the horizon. 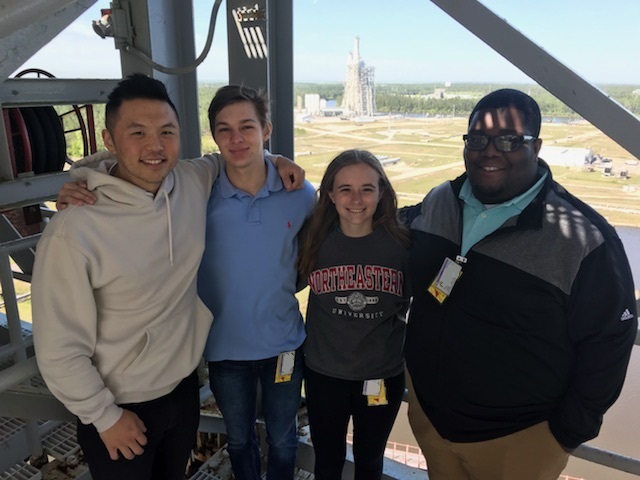 The once-in-a-lifetime experience was a true testament to how lucky we are to be law interns in the heart of space research and exploration. In March of 2015, NASA scientists and researchers of every variety ascended in droves upon the lobby of Hyatt Place, the hotel I was employed with, for the annual Lunar Planetary Science Conference. Imagine staying up in 2012 to watch the Curiosity Mars Rover landing and then just three years later bartending for a table full of the folks who made it possible. Picture yourself struggling to remain professional while a marine biologist and a physicist casually chat about fishing on Europa while you shakily serve them. To be clear, the entire time I was internally combusting with happiness. That’s where my NASA story began. Touring facilities at NASA’s Johnson Space Center. This journey has been the wildest ride of my life. 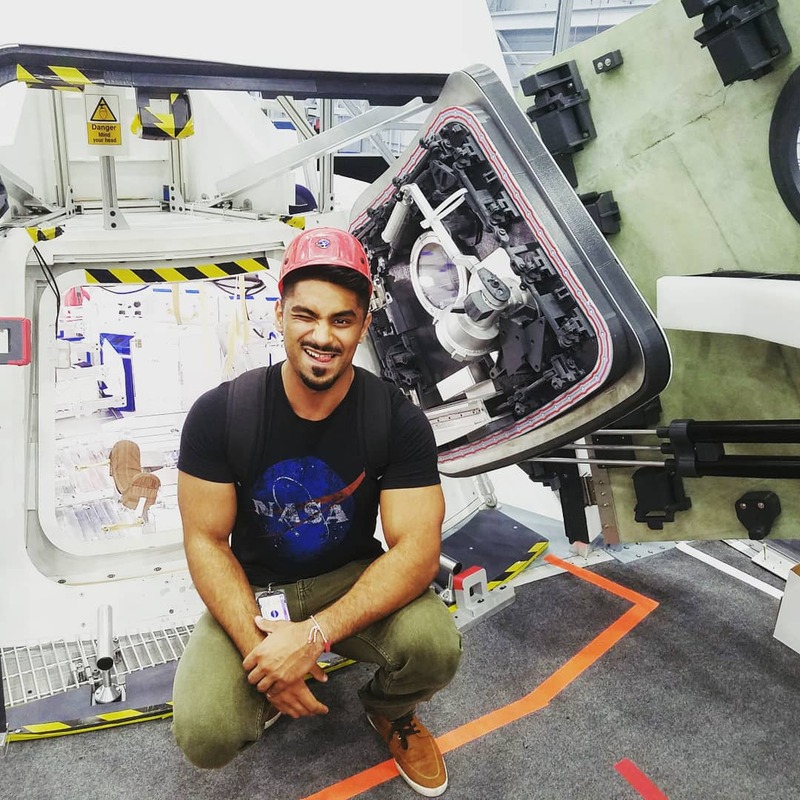 In 2013, I came out of high school in Houston, Texas, as a certified Emergency Medical Technician – Basic (EMT-B) with sights set towards medical school and the field of space medicine. To keep costs low, I attended a local community college and planned to transfer out as a Biology major after getting my basic courses knocked out. Everything was in motion, and at the time I thought I had my career all mapped out. In March 2014, everything changed when my father was shot and killed at his place of work. Overnight, my map was erased. I decided medicine was too costly and too time consuming of an endeavor to put my family through. My passions needed to take the backseat. I wanted to provide. I changed my degree plan from Biology to Accounting and kept my head down. Then, in March 2015 I met Sheri Klug Boonstra, now a dear friend, who at the time was representing Arizona State University and NASA. She took the time to ask about the shine in my eyes when something about science perked my ears up. Late that night, when the bar was closing down, we spoke about the magic of space, the purity of pursuing the truths of the cosmos, and well, just how dang cool the human capacity to explore really is. She left me with a NASA sticker that still sits on my laptop today. When I got to the University of Texas at Austin, that sticker stared me down into delaying my graduation and diving back into biology just one year out from graduation. Sunny participating in an outreach event at NASA’s Johnson Space Center. In my final semester of college I applied for a NASA internship with the International Space Station Program Science Office. My GPA wasn’t the best—but my passion and drive were unmatched. One morning my phone rang for an interview, and four days later I ran out in the middle of my Geology lecture—literally in the middle of campus—shouting that I just got my dream job. When I got here that first day, I sat in my car silently with my eyes wet like a very tiny chef was chopping onions underneath them. Six months later and that tiny chef and his onions are still there every time I see the flags at Johnson Space Center. That sticker Sheri gave me years ago now has 10 different NASA stickers to keep it company. I’ve been fortunate enough to work with people who have literally left this world, write as a credited author about the economics of space, and have had the honor of serving my country’s finest minds and ideals. The most amazing part of my time here has been reaching out to the public and organizing my own NASA outreach events. Taking the time to listen to the passions of our next generations and exciting students is something that I firmly believe is a responsibility we all carry. Thankfully, NASA continues to support and fortify that endeavor. It’s not about what gets you through the day. Surveying the sky above, the vast cloak of twinkles wrapped around our world, all I can really think is that there’s nowhere I’d rather be. Looking at that blanket of stars is what it’s taken for me to understand that life isn’t about getting through the day – it’s about finding what keeps you awake at night. For me, that’s NASA. 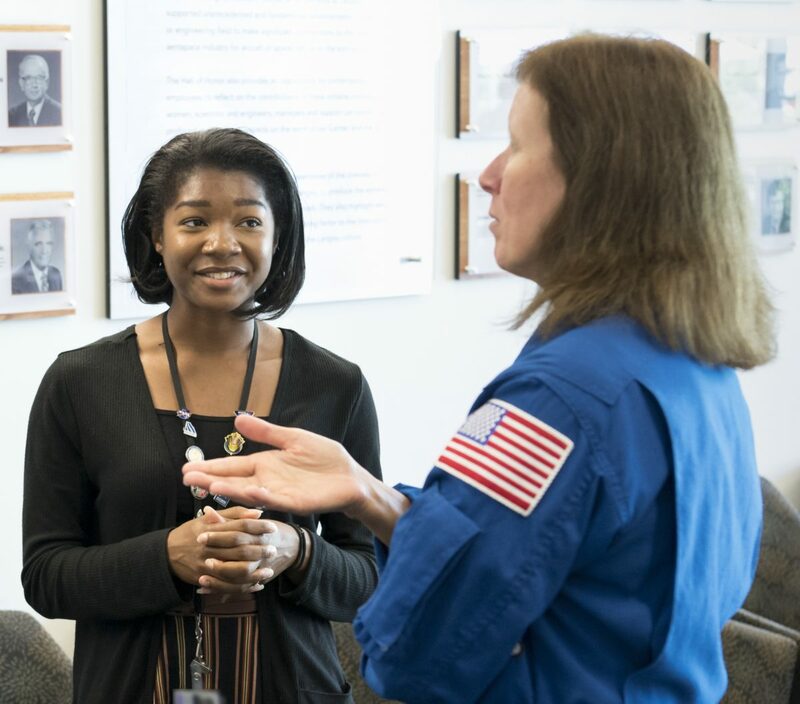 Find current internship opportunities at intern.nasa.gov!